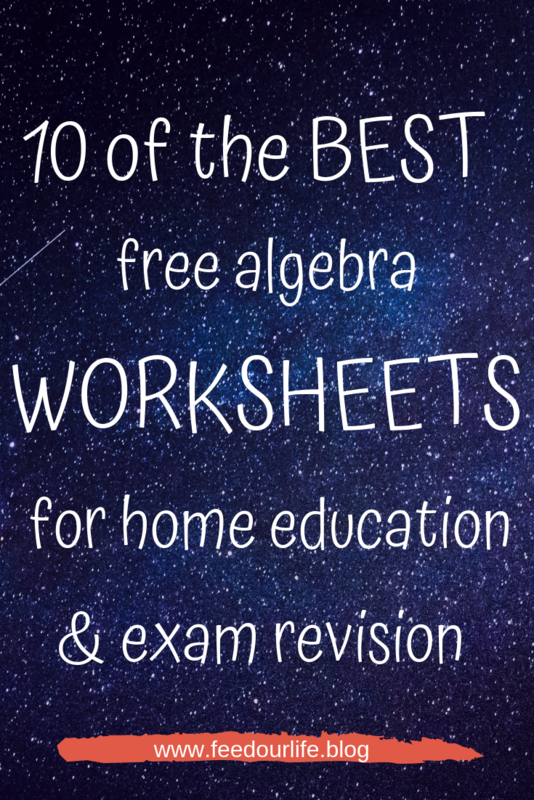 gets Lots of free math algebra worksheets here! Printable Worksheets – this site collates various worksheets from all subjects, so this one is well worth browsing through to see if you can find resources that will suit your lessons! Here are the Solving Equations worksheets I used this week. There are a load more different ones if you look down the right hand side of their page! 2. Math-Drills – this site has some great worksheets and I have linked you to their page containing their most popular algebra worksheets for the week. 3. Maths Warehouse – This site looks great! I haven’t yet used their algebra worksheets as my son has not reached this section or level of work (graphs and plotting points, among others). They also have a handy little automatic equation slide at the top of the page, reminding kids how to do equations – very handy! It’s worth browsing through to see if you can use their resources for revision for GCSE exams. If you are not ready for their worksheets, then bookmark their site for use later on! The link here is to their whole Algebra page. 4. Kuta Software – They have a range of various algebra questions and answers, plus many other math worksheets (pre-algebra, geometry, pre-calculus and calculus). I have used their multi-step equations worksheets for my son this week which you can access in the Equations box on their Free Algebra 1 page. 5. Home School Math – If you would like to use just one site and generate your own worksheets as and when you need them for your child’s lessons, then try this site! They have both ready-made worksheets AND a generator which you can use to create daily revision worksheets! Great!! Here are their free worksheets for linear equations page. 6. Easy Teacher Worksheets – this site has science, English, social studies, foreign languages AND graphic organisers and teacher printables! We used their Solving Equations worksheets in our home ed classes these last two weeks. If you check out their menu Math worksheets by topic down the left side, you will find a host of worksheets you can use! 7. Helping with Math – Here are some more math worksheets – Solving Equations AND check out the related resources at the bottom of this page. They also do all subjects and by grade too! 8. Math Aids – I have used loads of worksheets from this site over the years! So it’s one of those that you should bookmark! Here are some algebra worksheets to get stuck into! 9. Super Teacher Worksheets – These basic algebra worksheets introduce kids to using and writing algebraic equations with letter variables. They also cover all other sections of math too! 10. Algebra Worksheets – I just found this site! We will definitely be giving their worksheets a try. They also advertise that you can do exercises on the ipad too. Here is one on Variable Expressions. If you found these useful then please follow my blog to receive an update every time I add more free stuff to my site!! Check out these free sites I found where you can explore the wonderful world of science! CK12 Flexbooks – This site has guide books for Math (Grades 1-5, Arithmetic, Measurement, Algebra, Geometry, Probability, Statistics, Trigonometry, Calculus, Analysis), Science (Grade K-5, Earth Science, Life Science, Physical Science, Biology, Chemistry, Physics), English (Writing and Spelling) and other subjects like Engineering, Technology, Astronomy, History (US), Health. Teach Engineering – STEM curriculum for K-12. Troy and I have been revising positive and negative numbers these past two weeks and I thought I would put together a printable poster for him, just to help him remember the basic rules! In actual fact, these rules are carried right through to the completion of his maths studies and beyond, so getting to grips with them NOW will save a whole lot of hassle later. I have included my FREE Positive & Negative Numbers Printable here for you to download too! I hope you find it useful. Well, that’s literally all today, just wanted to share my freebie with you guys! Have a safe and blessed weekend ahead!! I have been looking for a decent English curriculum for Troy (11 years old) for our home school daily schedule. I think I have just found what I’ve been looking for!!! I came across this website called Easy Peasy All In One Homeschool which is a Christian-based site offering a FREE curriculum for homeschoolers in ALL subjects!! WOW! The one I’m mostly interested in is their extension site called Easy Peasy All In One High School English-8 for Troy’s English lessons! It looks achievable and simple to follow too. Each day is set out for you. Just follow the instructions for each English subject for each day and click on the links provided. Easy Peasy. If you are looking for a good solid and free curriculum, I can honestly recommend that you check out their site. Even if you don’t want to use the full curriculum, you can choose subjects that pertain to you from the drop down menu on the right hand side of their pages. Okay, so you’re thinking about home education. In case you were wondering, YES it is LEGAL to home educate your child in the UK. So long as you follow some very simple rules, you can start on your home school journey today!! UK: If you go onto the Gov site they walk you through what needs doing first. You must write a letter to your child’s head teacher, explaining that you are removing your child from the school roll (deregistration). You do not have to explain yourself. But you do need to inform them that your child will not be returning to the school. (You cannot send your child to school some of the time. He/she will be removed permanently). The school will then inform the council. The council will then contact you at some future point for an informal discussion regarding your child’s educational needs and what you are planning to do, or have been doing with him/her. You do not need to follow the national curriculum or enrol into a Home School school. All you need to provide is a reasonable education plan. However, if the officer feels that your child is not being given a substantial education, then he/she can serve a ‘school attendance order‘ and insist your child returns to school. This can include prosecution and/ fines. To find out what the council in your area can help you with in terms of home education, click this link, enter your post code and follow your local council’s directions. Home Education FAQ – this is a super website packed with some awesome information so it worth your while taking a look. Some of the links don’t work, but I think all the information is up to date. Elective Home Education Guidelines – This is the Gov.UK site’s info for local authorities. The Revised Funding Guidance For Home Educated Children may be interesting to some!! Families home educating children with special needs may be eligible for funding! And some local authorities may be able to provide financial support for examination fees!! (No 9 in the guide). School Science for all ages – this is a super site!! Packed with science based activities you’ve got to include in your home school curriculum. Brought to you by the Association for Science Education. BBC Learning – which includes Bitesize. Bitesize has comprehensive primary and secondary revision pages for all subjects. This was one of our favourites when my daughter was doing her IGCSE revision. Education Otherwise – This is a site that provides support and guidance for those considering home education or those in home education already. They have some handy sample letters which you can use for de-registering your child, as well as some other ones which you may find useful. They don’t have resource downloads that I could see, but do have an Amazon link to buy products for home education. Home Education Advisory Service HEAS – this is a website with lots of information for new home schoolers, but they do ask for a £16 annual subscription fee. However, there is still some reassuring information available on their site which you can access for free. Free Poster – promote home education in the uk! Download and print off this free poster provided by Home-Education.Org. Well, I hope I have given you some valuable information and reassurance that HOME EDUCATION is an alternative to main stream school and shouldn’t be anything to be scared or nervous of. If you would like more information about deregistering your child, or just general information about home education in the UK, please feel free to contact me and I will try and assist you where I can!! Please like / share / follow my page to spread the word, so more families feel confident to make the leap into the adventure that is HOME EDUCATION! !